Unit 5 – Demonstration of a 3 point fix. Aim. We saw in unit 4 how a position line is obtained from a single intercept; the aim of this demonstration is to establish a 3 point fix based on the intersection of three intercepts obtained from observations of three celestial bodies as detailed below. For the purpose of clarity, the calculations for the zenith distances and azimuths of the three bodies at the assumed position are not included at this stage. However, the next unit will explain how such calculations are made. Scenario: A yacht is sailing on a course of 090 at roughly 5 knots. Observations of 3 celestial bodies are made in order to obtain a three point fix. Of course it is not possible to take sextant readings of three celestial bodies at exactly the same time and you will see from the data below that there are small time intervals between each reading. You will also see, from the plot diagram, that the three intercepts are drawn from separate positions along the yacht’s course (i.e. AP1,AP2,AP3). Assumed Position: 47o 52’N, 47o 35’W. Dip (5.8m) -4’.2 -4’.2 -4’.2 . Calculated Altitudes at the Assumed Position. Calculated Zenith Distances And Azimuths At The Assumed Position. Plotting the fix. The next step is to plot the fix on the chart. 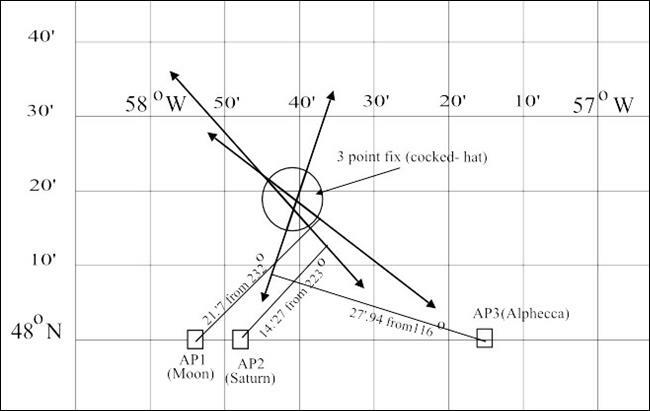 Because of the small errors inherent in astro navigation techniques, the three position lines will very rarely cross at one precise point. Usually, a small triangle known as a ‘cocked-hat’ will be produced and as long as the triangle is not too large, it can safely be assumed that the ship’s position is at the centre of this triangle. The diagram shows how the fix would be plotted on a chart. Note. Where position lines are derived from astronomical observations, the resultant position is not known as a ‘fix’ but is known as an observed position and is marked on the chart as ‘Obs’.